Good afternoon. I am delighted to be here at the second CIC Innovation Award Presentation Ceremony and to have this welcome opportunity to speak to the industry that drives Hong Kong forward and to the people who quietly, professionally and proudly build for Hong Kong's future. Allow me, first, to acknowledge this year's 124 award entries - for your creative commitment to the Hong Kong construction industry. And my warmest congratulations to this year's prize winners for your industry innovations and the many hours of dedication and hard work that brought them to life. Your ingenuity will, no doubt, inspire more ideas, insight and solutions to the many challenges facing the construction industry. In the World Economic Forum's Global Competitiveness Report 2017-18, which came out in September this year, Hong Kong was ranked the world's sixth-most competitive economy, up from ninth place the year before. And, more good news, we topped the world in physical infrastructure. A major reason for our improved standing was a leap in the innovation pillar. We are now ranked 26th in innovation worldwide, and given the current-term Government's strong emphasis on innovation, technology and creative industry, I am confident that we are on track to boosting our competitiveness in every sector and industry, including construction. In her inaugural Policy Address in October, the Chief Executive, Mrs Carrie Lam, made it abundantly clear that innovation and technology would drive Hong Kong's future - not as a single industry but as "a new model of development". To tie in with this thinking, the Chief Executive will chair the new high-level Chief Executive's Council of Advisers on Innovation and Strategic Development, as well as the internal Steering Committee on Innovation and Technology to contribute ideas on future innovation and our strategic positioning in the future global economy. There is an old saying that we cannot solve our problems with the same level of thinking that created them. It speaks eloquently of the critical value of innovation in tackling challenges, large and small. In the construction industry, three challenges come immediately to mind: surging costs, environmental impact and construction-site accidents. I am hardly alone in such thinking, as the theme of this year's Innovation Award - "productivity, sustainability and safety" - has made it clear. In fact, there will be a press conference this afternoon on smart city to be led by the Secretary for Innovation and Technology, Mr Nicholas Yang. This is a very important step forward - smart city, liveable city. 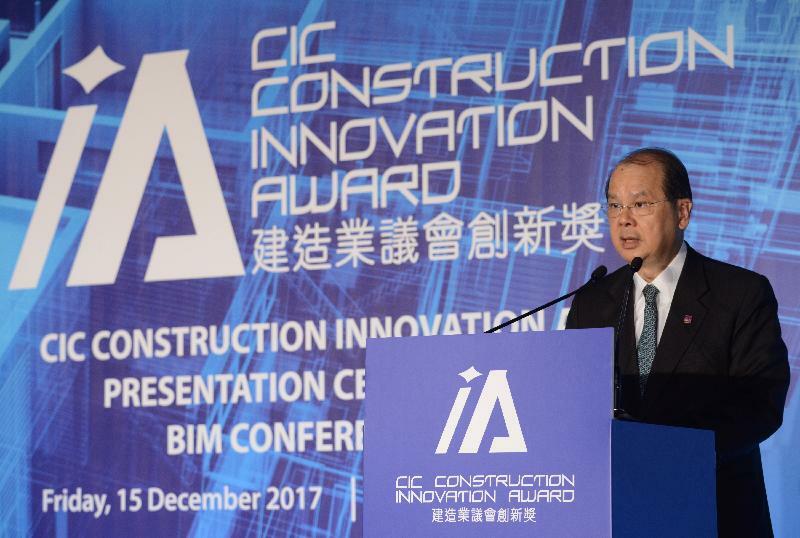 The Hong Kong Special Administrative Region (HKSAR) Government is determined to take the lead in adopting BIM in major capital works projects. Starting from 2018, more than 30 projects in the pipeline will adopt BIM in their design and construction stages. I am delighted to note that following the award ceremony and luncheon today, the CIC will organise the BIM conference this afternoon which makes a welcome statement about the CIC's commitment to BIM's industry-wide adoption. I believe that it will also signal to the private sector that the time to transform and apply new technology has come. New Engineering Contract, or NEC, is another innovative approach to boosting construction productivity. Public work projects adopting NEC have enjoyed some success arising from the collaborative partnership between government works departments and their contractors that shared the common goal of completing the projects effectively. To date, more than 80 works contracts have adopted the NEC approach, including the Happy Valley Underground Stormwater Storage Scheme. Piloting the open-book target cost option under NEC, it has enabled such cost-saving innovations as alternative foundations with subsoil drainage systems. The Storage Scheme was completed in March, one year ahead of schedule, and with savings of some HK$60 million. I would say that makes a compelling statement. On top of the Government's pioneering efforts, the grand opening of the Construction Innovation and Technology Application Centre last month marks a milestone in the construction industry's efforts to promote interdisciplinary research and application, especially among small and medium enterprises. With the CIC's leadership, and the support of industry stakeholders, I am confident that the construction industry will take up the challenge of improving productivity through innovation. Climate change is another issue - a growing challenge for every economy and every industry in the world. Buildings, as you well know, account for 60 per cent of Hong Kong's carbon emissions. Curbing those emissions demands innovative technology in building design and management together with energy-efficient equipment. Let me add that our embrace of green buildings does not end with construction. We are determined to minimise our carbon footprint at the maintenance stage. That represents about 90 per cent of a building's life cycle. In this regard, the Electrical and Mechanical Services Department of the HKSAR Government has developed a Building Energy Management System to boost energy performance through the interface and integration of control systems and legacy meters to allow efficient data analysis for greener operation and benchmarking of energy usage. Safety, too, impels us to adopt innovative construction methods. Hong Kong's infrastructure continues to enjoy recognition as world-class because of our strong workforce behind the scenes. That said, I am concerned about the fatal construction accidents that have occurred this year, despite continuous improvements in Hong Kong's overall occupational safety and health. Construction processes are sophisticated and complicated, and they can vary greatly from one project to the next. While the industry is working diligently to build a safety culture, the Government has a role to play in ensuring the safety of construction workers. That is why this year's Construction Safety Week carried the theme of "Workers' Behaviour". Apart from nurturing a safety culture in workers, we are looking into adopting prefabrication as well as automation and robotics that can provide a safer environment for construction workers. The Development Bureau is also studying the adoption of Modular Integrated Construction for the construction industry. Under this construction method, the conventional labour-intensive and cluttered on-site operations would be completed in off-site prefabrication yards like industrial manufacturing. By adopting "factory assembly followed by on-site installation", Modular Integrated Construction would boost productivity and quality. No less important, it would enhance construction safety through a better working environment and reduced working at height. The Government will, of course, remain open to all innovative ideas that can help realise construction safety. Ladies and gentlemen, you may have heard the phrase, "You can invent alone, but you cannot innovate alone." Innovation indeed is a collective process which requires contribution from all of us. This year's Construction Innovation Award entries and winners have greatly impressed me with their innovative technology for the construction industry. I look forward to seeing the products, technology and applications of today's winners on tomorrow's construction sites and throughout the industry. On this note, ladies and gentlemen, I wish you all a rewarding conference this afternoon, and a prosperous and safe new year ahead.